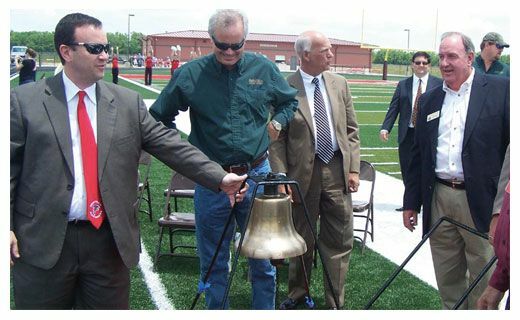 HUFFMAN — About 100 local sports fans celebrated the completion of a $20.5 million building program with an open house and ribbon cutting at its new state-of-the-art athletic facility, Falcon Stadium, preceded by an open house and ribbon cutting ceremony at the new administration building. Invocation was done by brother Mike Martin of First Baptist-Huffman. After brief speeches of recognition of support by the community a complete barbecue lunch was served to guests. HIGHLANDS  A rare day if ever was more scenic than the morning of May 25 when Sterling-White Chapel hosted a Memorial Day Service as joyously beautiful in natural flora as it was in man made vistae. Old Glory herself was then raised in the center of The Avenue of Flags which features flags that have flown over this country and servicemen before it was a Democratic-Republic as a nation. This Color Guard and Pledge of Allegiance was performed by Boy Scout Troup #107 under the direction of Earl Dickey. Funeral Director Jeff Moore then briefly offered welcomes and orientation for visitors on behalf of Sterling-White Funeral Home and Cemetery. All matters of faith were the providence of Pastor Jerry Hovater including the prayer and dedication of the ceremony including sermon. Guest speaker was Major Quenton L. Farr of the United States Army, the Senior Army Instructor for the Crosby High School JROTC. The Roll Call was performed by Don Guillory of Crosby American Legion Post 568. Taps was played by Dana Red with a jazz twist. 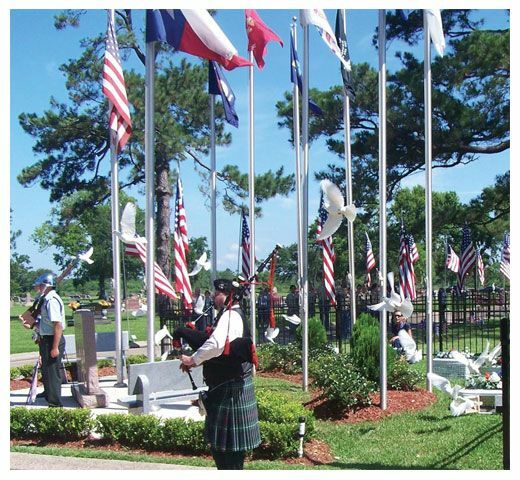 Pipe Major Tom OBrien played Amazing Grace as doves were released throughout the cemetery. 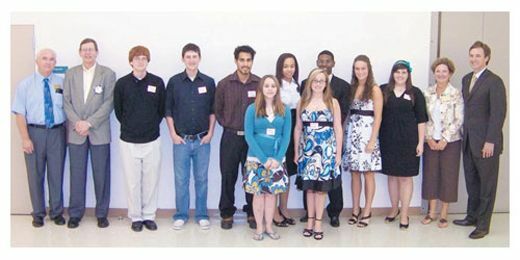 Each year, the Crosby/Huffman Chamber of Commerce Education Committee honors those students that elect to take the tougher courses with a special luncheon and door prize presentation for the lucky and advanced educated. 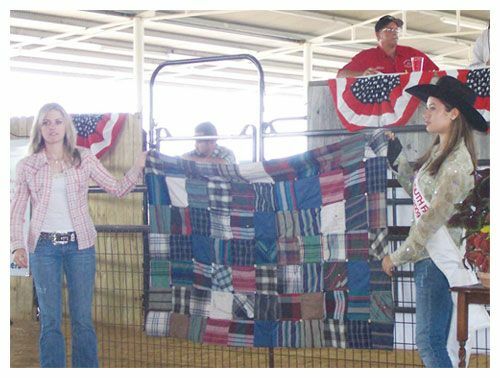 This year, the event was held at the Crosby Fairgrounds on May 22. In recognition of business excellence, All About Fun from Dayton honored as the Lee College Small Business Development Centers 2009 Business of the Year. Its A Girl Thing Boutique located in Highlands was the winner of Retail category for the Lee College 2009 Monument Awards. 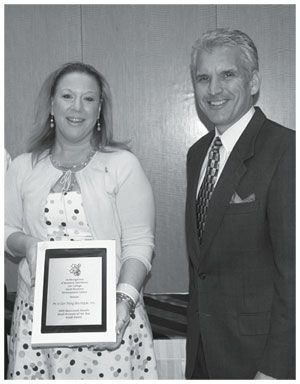 Pictured left to right are: Owner Michelle Lomazoff and Anthony Crespo, Lee College SBDC member. Lee College Small Business Development Center recognized Anderson Advertising and Design with the 2009 Rising Star award for small businesses. Not pictured is Restaurant SBDC Award winner Mustard Seed Tea Room. Earthscapes of Texas, Inc. from Dayton received a Monument Award in the Service category from the Lee College Small Business Center. EAST HARRIS COUNTY  Foreclosed and vacant houses that were once havens for illegal activity are getting a second lease in life thanks to a new program from Harris County. Precinct 2 Commissioner Sylvia Garcia said that the county will spend about $8 million in federal housing funds to purchase foreclosed properties, then resell the houses to residents at a discount. The program targets houses in specific neighborhoods where foreclosures have been most hurtful. 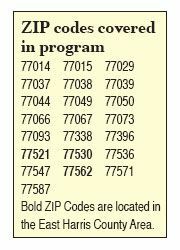 Of the 22 ZIP codes designated by the county for the program, three are in the Aldine/ Northeast Area. These are 77037, 77039 and 77093. Garcia said the program would be beneficial in that it will not only prevent the properties from decaying, which hurts the neighborhood image, but it helps renters become homeowners which brings stability and neighborhood closeness. To be eligible to purchase one of the homes families must earn less than 120% of the areas median income (about $76,500 for a family of four), have a job, decent credit and not owned a home in the last three years. The county plans to buy homes within the specified ZIP codes at a minimum of 15% below appraised value, then resell them at 30% discount below resale value. This could mean up to a 40% saving on a home. Additional discounts could also apply. New home-buyers can also get up to $10,000 for repairs. Those interested in the homes are encouraged to speak with their local real estate agent, who will have a list of the homes eligible through the program. The county says the program is not intended for those who buy houses cheap, repair them and then sell them for a profit. Anyone who sells a home purchased through the program is required to repay the county for the discounts off the appraisal value. GRAND CHAMPION STEER sold for a record $20,000. Raised by Jacob Beckham. CROSBY  The Crosby Fair & Rodeo expects to have more people attending concerts this year than at any other set of concerts before. The Fair Board put the limit of Cook-off teams this year at 60, and that number has already been achieved in paid cooking teams for the 63rd Annual Crosby Fair & Rodeo. The previous Cook-off record is shattered and this year there are to be two nights of concerts and parties both Friday and Saturday. Friday June 5 is a party featuring Roger Creager with Philip Griffin Band leading. It is the night in which the Showmanship Award is granted. The Business Showmanship competition is being held for the second year to encourage all businesses in the community to get in the spirit and support the members and volunteers of Crosby fair & Rodeo by decorating your business and store front with the My Home Town The Past, The Present and The Future of the Crosby Community and while the decorators are at it get a Country & Western theme going with that home town past present and future tense. Attendees this year are encouraged to purchase the $50 membership to allow admittance at each of the concerts and rodeo events and the membership dinner after the rodeo is concluded. Saturday June 6, the 63rd Annual Crosby Rodeo Parade will begin at 10:00 a.m. at Crosby High School. The parade will march North on FM 2100 to 1st Street turn left at Kernohan St. to FM 2100 then South to return to the high school. The parade this year will be lead by our local heroes, the veterans of the current conflicts that have returned home from active duty. All soldiers returning from active duty are to act as Parade Marshalls. Saturday night, June 6, the man the C.M.A. is going wild for, Jamey Johnson, is to be the featured act and Bo Cox is to be the lead. This concert is expected to bring in Country Music fans from throughout Texas on the Jamey Johnson crest as a rapidly rising star. His lyrical acclaim is a shooting star in the Western charts, especially after scoring a hit with George Straight. A carnival and concession area will be ongoing for kids and adults as the Cook-Off Progresses and during part of the week. Tickets are available at www.crosbyfairandrodeo.net, at the Crosby Fair & Rodeo Office at the Fairgrounds, Arlans Market and Crosby Ace Hardware. 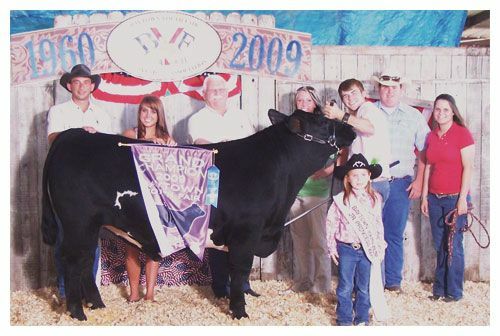 The Crosby Fair & Rodeo livestock auction is to be held on Wednesday, June 10 at 6:00 p.m. Thursday, June 11, local singer David Glenn leads for Kevin Fowler, ticket prices are $20 or $15 in advance. Friday, June 12, local singer Cody Kouba leads off for featured act, Eli Young Band. Saturday, June 13, Gene Watson leads off for the Bellamy Brothers. The PRCA rodeo will exhibit the cowboy arts in a fantastic competition Thursday through Saturday before the concerts begin. HIGHLANDS  Each year, a committee of Rotarians reviews scholarship applications, and based on grades, needs, and essays, awards a number of scholarships from the proceeds of the Rotary Chili Feast, and other fund raising events of the club. This year, eight scholarships of $1500, and four scholarships of $2000, were awarded to twelve deserving students, for a total of $20,000 toward their college education. The awards were made at a Scholarship Banquet, held last Monday night at the San Jacinto Community Center in Highlands. The featured speaker for the evening was Past District Governor of Rotary District 5890 in the years 2007-2008. Tallas is familiar with Highlands, having visited the club many times and presenting it awards for outstanding service. The speaker each year usually tries to give the scholarship recipients some advice on their upcoming college experience, and some motivational thoughts and how to deal with the future. Tallas complimented the twelve on their accomplishments, stating I want my kids to grow up to be just like you. He referred to the way they have achieved balance and success in their lives. He gave them some guidelines for their future life: the three Fs of Faith, Family, and Friends. He explained how these principles could be used throughout life to give meaning, enrich experiences, and help give solace and meaning to their future. Tallas also encouraged them to investigate Rotary opportunities in their future, such as Rotaract in college, or ambassadorial scholarships to pay for a year of study abroad. Committee chair Dr. Larry White welcomed the 12 recipients, who were picked from a field of 39 candidates. Dr. W. L. Doc Herndon Scholarship, presented by his daughter Patricia Scott to Stephen Muldrow. Each student who was present was asked to tell a little about themselves, and then what their plans were for their future. In addition, guests, parents and Rotarians were asked to share their thoughts on the importance of the evening and the meaning of the scholarships. Students spoke of their college choices and future careers: engineering, geology, pulmonology, marketing, international business, nursing, neurosurgeon, charity work, an awe inspiring list for the audience. Shattered Dreams shows grim realities of D.W.I. Some pretend to become immune to the gruesome vestige of highway carnage that goes hand in hand with driving under the influence of alcohol and drugs, this newbie does not. Not once after having witnessed infant heads torn off or entire families butchered has this reporter failed to have a visceral reaction and that is a nonobjective ringing endorsement for Shattered Dreams. 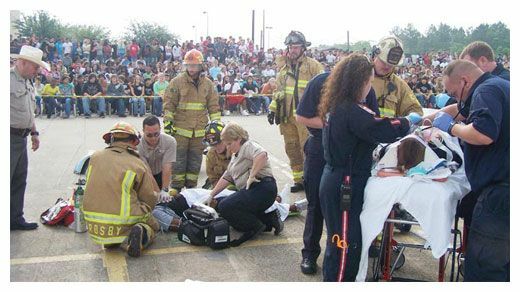 The program was an enactment put on at Crosby High School featuring the very possible scenario of a head-on collision between two cars loaded with classmates. One of the classmates pretends to die at the scene, one is loaded into a Precinct 3 Patrol Vehicle after failing a field sobriety test, one is pretend loaded onto a LifeFlight helicopter, one is pretend cut from a vehicle and loaded onto an ambulance. Some students have been involved with putting on this show since October. 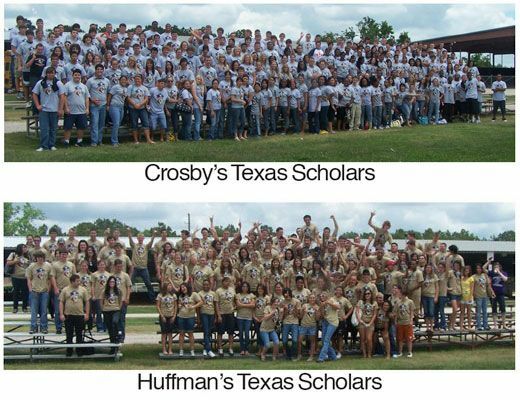 Many local entities in the Crosby/Huffman chamber of Commerce contributed. The list of financial contributors to the project also includes those that volunteered time. One must also examine who sponsored this event, none other than esteemed leaders of this community that are known to be concerned about the well being of young people: Representative Joe Crabb gave several hundred dollars, Mr. and Ms. Mike Joseph, Judge Mike Parrot, Harris County Justice of the Peace (Pct. 3, Place 1,) Constable Ken Jones, Crosby Fair and Rodeo, Inc., Crosby VFW Post 9761 and Ladys Auxiliary, Hotchkiss Disposal Services LTD, Hudson Mechanical, Casper Wrecker Service, Harris County ESD No. 5, Crosby Volunteer Fire Dept., Sterling-White Funeral Home, Mark Walker Trucking, and Memorial LifeFlight. On average, someone in the State of Texas dies every 30 minutes due to an alcohol related accident.